The third annual PeopleSoft RECONNECT conference was held at the O'Hare Hyatt Regency, in Rosemont, IL, last week. Session Presentations are scheduled to be available for Questdirect.org members on August 11th. Although somewhat skewed toward the Midwest, the conference drew a varied customer base - Chicago is a nicely central location for this conference - across industries and geographies. Banks, universities, manufacturers, insurance; a good sampling typical of the overall PeopleSoft customer base attended the conference. Paco Aubrejuan and Amira Morcos, as usual, gave the PeopleSoft strategy and PeopleSoft Financials update, and this was the first opportunity for Oracle to present the newly released 8.54 Tools. The 8.54 Fluid UI will be supported in Image 10 for FSCM, and Image 9 for HCM. "Over 95%" of PeopleSoft customers renewed maintenance, (a high number for any vendor). There are no 9.3 releases planned. PeopleSoft Update Manager will provide fixes, bundles, and new functionality. 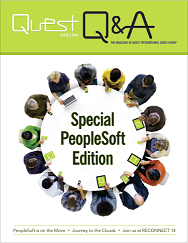 Quest has made RECONNECT a PeopleSoft-specific conference, a "deep-dive" in their words, which means there was little to no discussion of Fusion, clouds, or co-existance strategies. While this may make a certain amount of sense, at least today, Quest (and OAUG) seem determined to posiiton Collaborate as their major applications conference, and Openworld, for all its size-related hassles and expense, also has a strong PeopleSoft presence and agenda. But RECONNECT is large enough and draws a strong crowd of experienced, knowledgeable PeopleSoft people, and for those PeopleSoft customers not already committed to the annual Alliance Conference, Chicago in the summertime might be the best place to keep abreast of all things PeopleSoft. As we've said before, we continue to see RECONNECT as a worthwhile conference. We enjoyed seeing past customers and meeting prospects. Madeline Osit, our COO, gave a joint presentation with the International Monetary Fund on Enhancing Procurement in a 9.2 Upgrade. And (more news to come soon), we quietly previewed our new BEAM Data Manager product, which will be released in August.